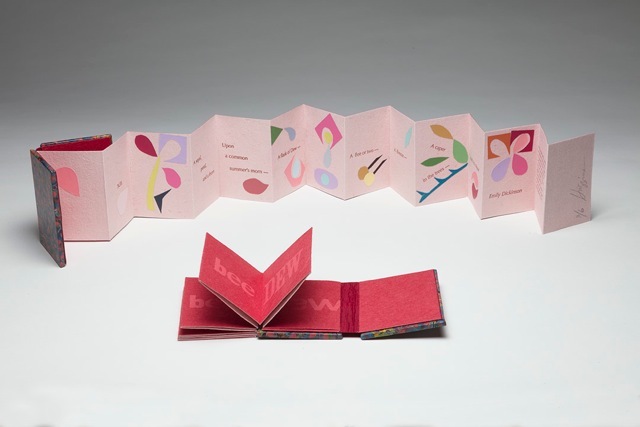 Fourth in a series of miniature books featuring poems by Emily Dickinson. Accordion structure, hand painted boards, gold stamped leather band. Letterpress printed on hand- dyed Cave paper. Collaged imagery. Reversing to pink kozo paper, letterpress printed with antique wood type. Box of hand-painted paper with E.D. blind-stamped on the spine and a leather, gold stamped inset on the cover.